It was 11 AM in New York City, April 27, 2014. Where was I? At the Green Festival on Pier 94, of course! Huh? I was in New York to meet my three sisters and our husbands, although half of the crew hadn’t yet arrived. My sister Kay and I roughly mapped out our day for this particular Sunday, being sure to save major exhibits and events and even restaurants for when the entire gang was assembled. 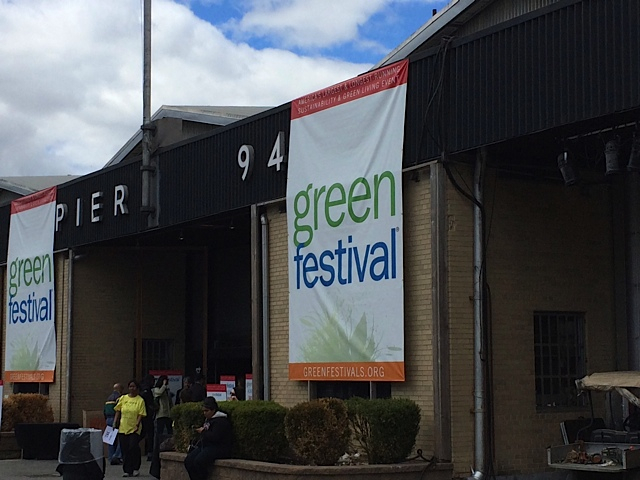 And so it came to pass, in the land known as the Big Apple, that we attended the Green Festival, a huge event with products and services displayed to encourage “green” living. As you can imagine, the massive convention- center like room loomed large – and we were greeted with green t-shirt-adorned 20 somethings. People at the check in booth looked more like Seattleites than New Yorkers. First up, the Green food displays. Woah! Pretty much everything was labeled non-GMO, gluten free, locally sourced, non-dairy, vegan, vegetarian, sustainable, organic, eco friendly, no sugar added…with lots of samples of ice cream (sans dairy), energy bars (lots of dates and nuts), and countless flavored energy drinks. Why did we bother to have breakfast anyway? I bet you think I came for the food booths, but you are wrong. I was just as interested in the whole enchilada – the beauty products, home products, and everything else. 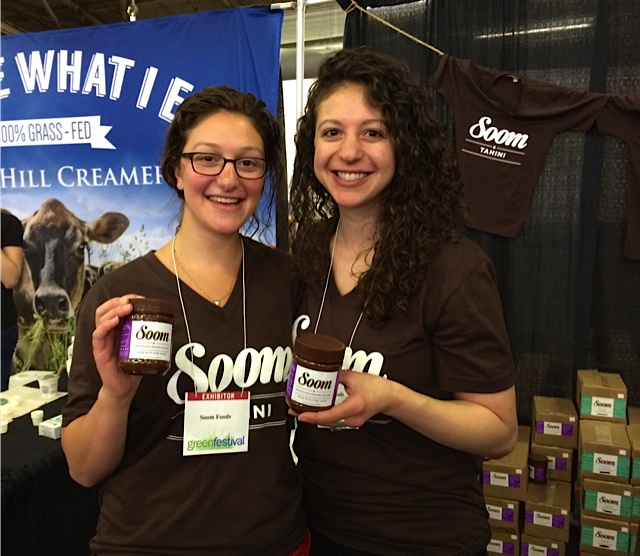 Along the way we met Kay’s acquaintances from Washington, DC: two of the three sisters who started Soom Foods. 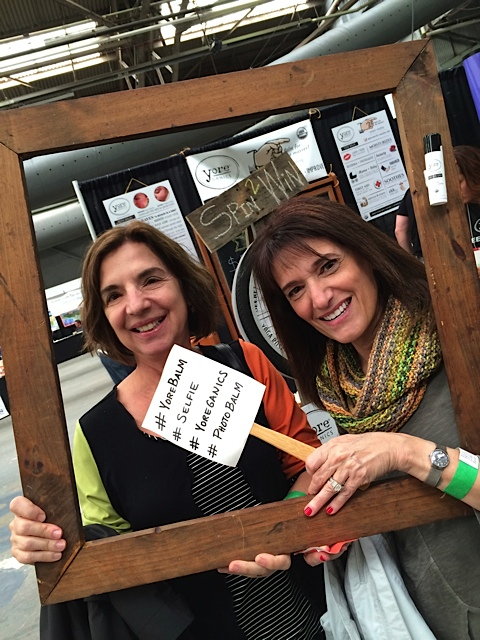 Kay’s acquaintances from Washington DC, the founders of SOOM Foods. Their products now include chocolate tahini and the packaging is fresh and the font is now large enough for me to read with my old eyes. If you haven’t yet tried this tahini, it is available on Amazon.com and it’s so worth choosing this brand for many of the recipes I’ve posted (salad dressing, tahina sauce for meats, hummus, even cookies). On to the green, eco friendly, non-food items, beauty products, packaging and cookware. My personal favorite was Three Blue Birds. This small, Connecticut-based company displayed the most adorable 100 percent biodegradable Swedish dishcloths. Read all about them here. The cloths I loved most were designed by Lasse, Lynda’s Finnish-born husband. In chatting with them, I learned that Lasse is an engineer by day but loves to come home and draw designs for these dishcloths. I purchased a dozen to give as hostess gifts, birthday gifts, you name it. After a few hours, Kay and I stepped back out to the sunny New York weather and continued our day as tourists. I loved our time together – it was one of those activities we hadn’t thought of doing until a couple of days before the festival. My kind of travel for sure – I try not to be rigid with what I will do and like to fly by the seat of my pants to find pearls of adventure at times! 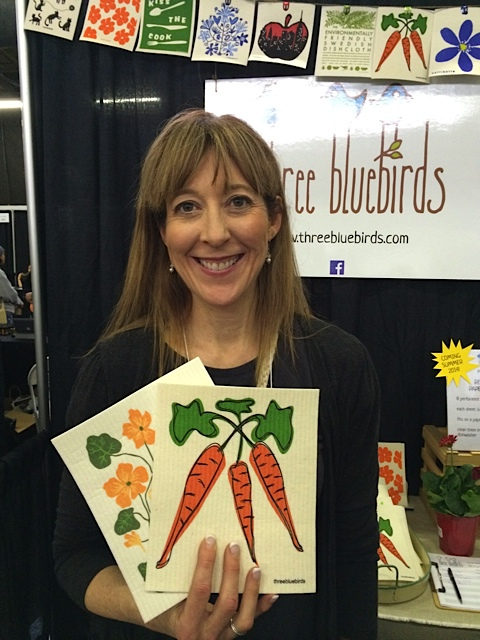 This entry was posted in North America and tagged New York Green Festival, Soom Tahini, Three Bluebirds. Bookmark the permalink. Missing the most adorable one of all!